North on 85 until you come into Niceville. Howell Road is the last left you can make before the light. Turn onto Howell. Alpine Bicycles is the second parking lot on the left. Head North on John Sims Parkway until you reach the 85 South intersection. Make a left at the light onto 85. Immediately get in the right lane and make the first right onto Howell Road. Alpine Bicycles is the second parking lot on the left. Take highway 98 east until you reach Legendary Drive. Turn left onto Legendary eventually going over Midbay Bridge ($2 Toll). Continue North on White Point Road. At the State Route 20 intersection make a left. Continue West on 20 passing the 85 North cut off and onto John Sims Parkway. Make your way into the right most lane and merge onto 85 South. Make the First right after getting onto 85 South onto Howell Road. Alpine Bicycles is the second parking lot on the left. After a few weeks research and talking to several reps I settled on HED wheels for this build. HED stood out from the others for a few reasons. Most importantly was the weight requirement. HED Jet 4 wheels come with a 230 pound rider weight limit in their stallion configuration. 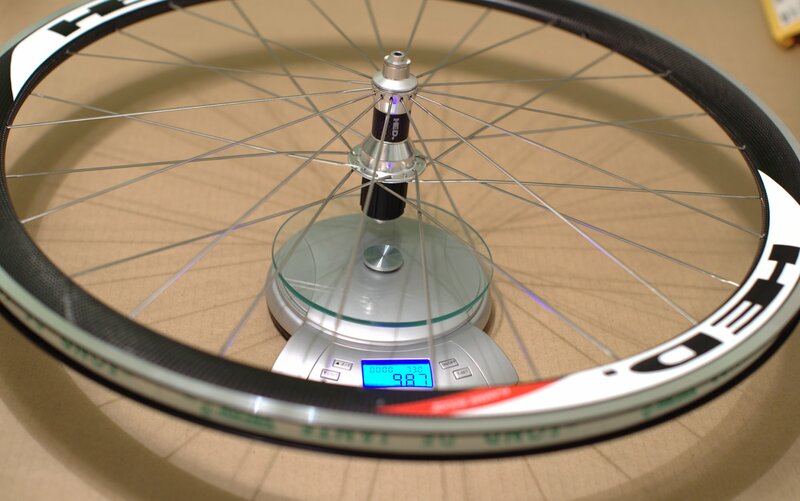 After speaking with Andy from HED I learned they can be made even stiffer with the use of heavier spokes. What I eventually settled on was a custom build of the Jet 4 Flamme Rouge. 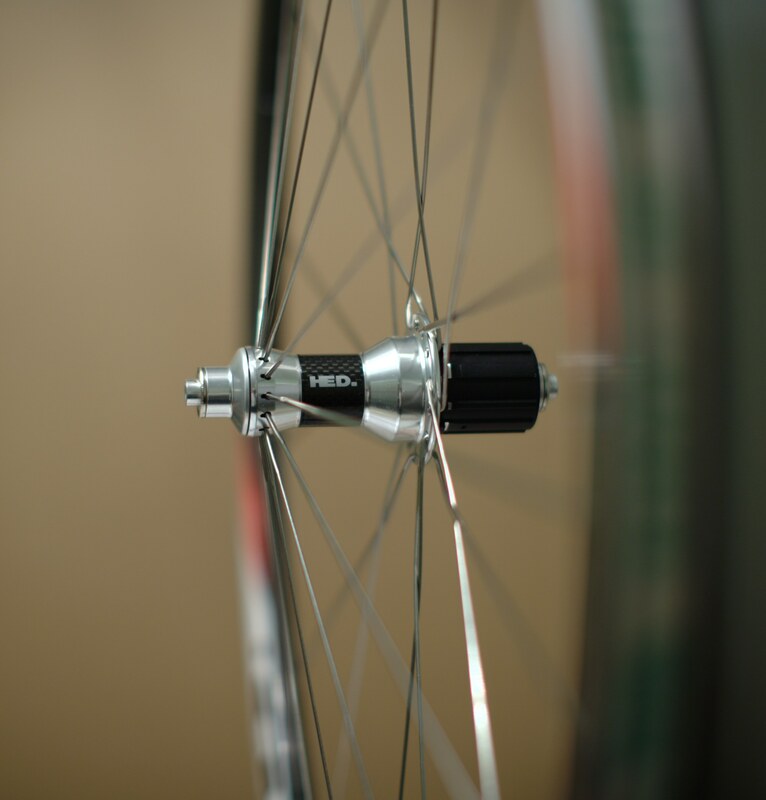 While the Jet 6 was tempting, the Jet 4s made more sense as an everyday wheel as they are suitable in more wind conditions as well as can use a standard valve stem with no need for extenders. Lets start with the basic info on these wheels. They use a scandium outer hoop, coupled with a non-structural carbon fiber fairing. This configuration allows the rims to have all the strength of an alloy hoop while having the aero advantage of a composite wheel. Because the carbon is not structural it also allows for substantial weight savings. 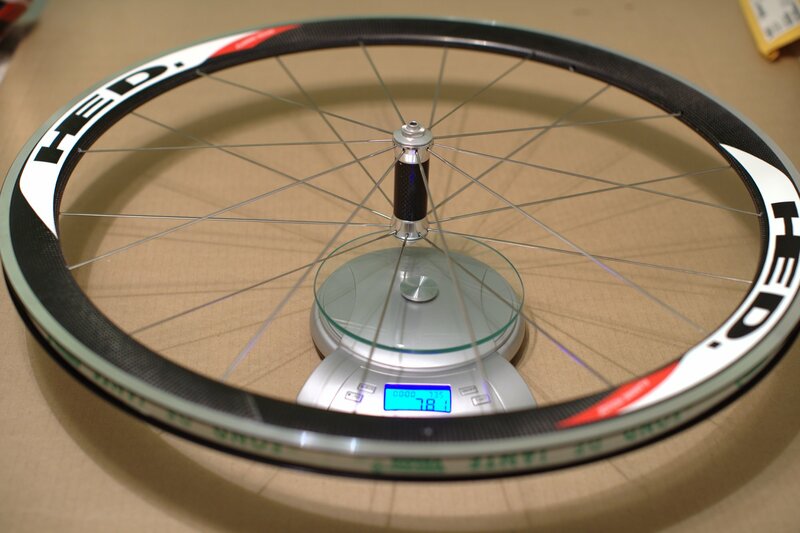 Worth noting is all HED wheels are currently 23mm wide. This requires special consideration when selecting your brakes, but allows lower tire pressures to be used. 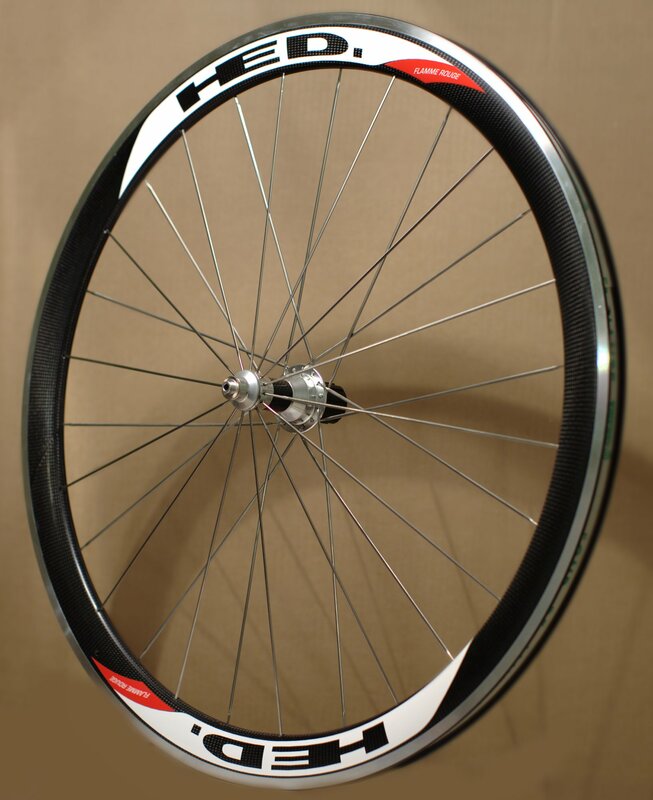 So what sets the Flamme Rouge variant of these wheels apart from the base Jet 4? It starts with the upgrade to a scandium outer rim from the basic aluminum rim. From there they add a few titanium bits to reduce weight as well as a carbon fiber hub shell. At that point the FR variant is both stronger and lighter than the base version. Then they throw in ceramic hybrid bearings to increase roll out. All said and done the FR is stronger, lighter and faster than the basic version. Build quality is where HED really starts to stand out. Zipp, Flashpoint, Mavic, and many other high end wheels come through the shop every day. The disturbing trend is they are all being made to sloppier and sloppier tolerances. Everything from structural resin voids, to 2-3mm out of true and dish. On wheel sets that are often 3000+ dollars this is not acceptable. In general we spend 30 minutes ore more getting wheels ready to sell that are brand new just because of some questionable QCQA. These wheels arrived and needed very little work. The front tension was 64-71, with the rear 92-100. The rear was just slightly out of true measuring .048 on the run out gauge. Compared to other wheels we see, these were a godsend. With the weight with tape at 781 front 987 rear these were as advertised. Worth noting is these rims require slightly wider that normal rim tape. In the end all that matters is how they ride and preform. With just 300 miles on thes rims I have a few initial impressions. First and foremost these rims feel very live. Response is great while still having a compliant ride. The rear free-hub is a little louder than most, but you are not supposed to be coasting. On the second ride with these we had some pretty nasty cross-winds gusting to over 25mph. Even at 220 pounds this cross wind was very pronounced and did product a little wag in the bike when under 20mph. North of 20 however there was almost no perceivable throw to these. They were also a great deal quieter than another riders Flashpoints. All said and done I am very impressed with HED. I will be ordering more of these in the future and can honestly endorse them to almost any rider. Over the past five years, I have ridden somewhere in excess of 20K miles. During that time, I acquired two pairs of entry level Lake CX-165 cycling shoes. They’ve held up reasonably well, although I cracked two pairs of the plastic soles near the cleat bolts. The first time, several years ago, Lake honored their LIFETIME warranty without hesitation. Recently however, Veltecsports, the owner of Lake Shoes seems to have cheaped out and now states the warranty is only good for one year. Anyways, warranty aside, this Christmas I was lucky enough to be gifted a pair of Lake’s flagship cycling shoe: the Lake CX-330c. Within seconds of opening the box, I noticed two things: a unique lacing system and the very thin, beautiful manufactured carbon fiber soles. Overall, the workmanship is good. Seams are held securely with no excess threads. The Kangaroo leather tongue is exceptionally thin with only a small pad in the center, but as I would later find out, entirely adequate for the task. Soles are glued to the upper and the interface is clean, without excess glue. They have mesh panels for ventilation and polished leather accents. Fit is spectacular, likely due to a combination of the BOA lacing system and the Kangaroo leather upper. 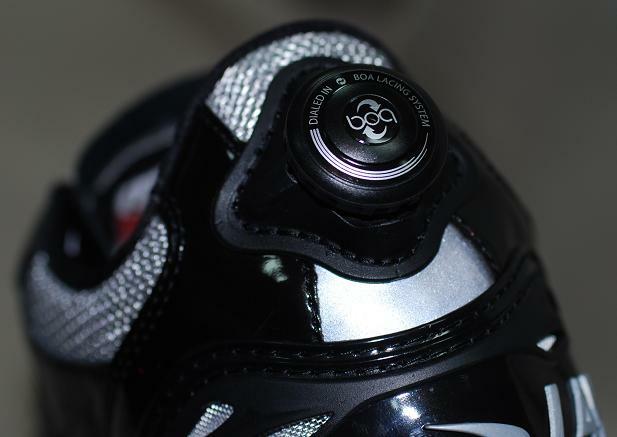 The BOA lacing system replaces traditional shoe laces, ratcheting buckles, or Velcro straps. The system consists of an extremely thin, polymer coated braided steel cable, large U-shaped tracks (where eyelets would normally be placed), and a knob at the back of the shoe that spools in the laces. I was skeptical at first, but found that you can tighten more securely than you ever thought possible WITHOUT pressure points. It’s also FAST. A simple pull of the buckle releases the cable tension and you can slide the shoes on easily. Push the buckle in, and twist to tighten. That’s it. No fuss, no tying shoe laces. On the bike, adjustments are easy and quick: simply stop pedaling for a split second and adjust, either way, tightening or loosening. After riding, one click and you pull the shoe off. I know, it sounds stupid saving a few seconds getting ready or packing up after a ride, but it is very noticeable. If you do triathlons, BOA is the system hands down. Reliability of the laces? BOA seems to think they will last and provides a LIFETIME warranty. Having ridden with the Lake CX-330c’s for about five months (about 3000 miles) and I can state that I true enjoy the shoes. The carbon fiber soles are noticeably stiffer than plastic soles and offer about a 5mm reduction in platform height, adding stability and better power transfer. The change in height is enough to require a saddle height adjustment. Be careful of cleat bolt insertion, as I have had to use longer cleat bolts as they only partially insert into the retainer behind the sole and may strip or be damaged. A quick repair and a longer bolt fixed the problem, but for $300+ shoes, you'd think this would have not been an issue. Comfort? Padding is sufficient but thin overall. The BOA closure system distributes pressure evenly, so the thin padding doesn’t seem to be an issue. The heel cup is firm but well padded. Fabric covering the heel cup is one piece and attached without stitching, so there is not the typical thick ridge of material near the top. The heel cup fabric is stitched at the forward edge, but resides behind the tongue so chaffing is not a problem. While untested, it appears that the shoes could be worn sockless, again for the triathlon folks. Ventilation is good, with lots of wire-mesh looking panels above the foot and along the sides. Summary: Lake’s CX-330c is a well made, well designed shoe that fully utilizes the benefit of the BOA lacing system. Cost is on the higher side, but BOA warranties the laces and ratchet system for life. I'm not so sure about the warranty from Lake, given difficulties I have had replacing other shoes under warranty. I really enjoy the shoes, but knowing what I know now, I'd likely have gone for a high-end Pearl Izumi (no BOA) or pair of Specialized shoes with the BOA system. In all, I LIKE the BOA system. I'm less thrilled about Lake's new owner, Veltecsports.com.